Supported fast-growing startup during boom of online video and growth of New York's Silicon Alley tech scene. One of 4 companies participating in alpha test of YouTube's livestreaming product. Helped produce three 20-30 minute segments, including moderating of comments live during broadcast. 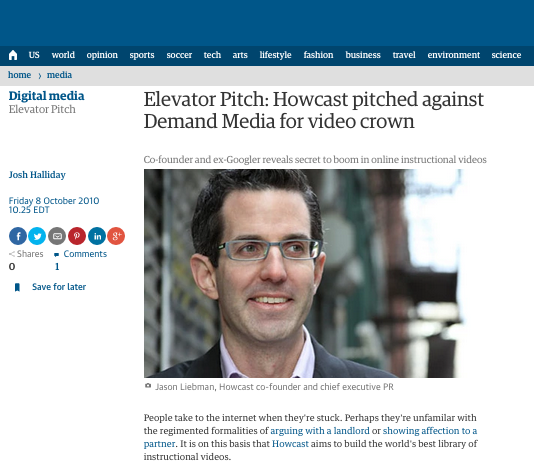 Howcast was mentioned in more than 200 articles, and prominently featured in several including Wired and CNN.com. Oversaw PR strategy and outreach for 2010 Summit, featuring speakers such as U.S. State Department aide Jared Cohen, Twitter Co-founder Jack Dorsey and WPP CEO Sir Martin Sorrell. Positive coverage earned in outlets from CBS News to Wired UK. Worked with U.S. State Department team to share goals and details from delegation with U.S. media. Delegation featured notable technology leaders from companies such as eBay, AT&T, Wordpress, as well as actor/investor Ashton Kutcher.